BlahBlahCafe :: View topic - Combo 310 Unique for Reason is now available. Combo 310 Unique for Reason is now available. Posted: Mon Aug 24, 2015 8:27 pm Combo 310 Unique for Reason is now available. 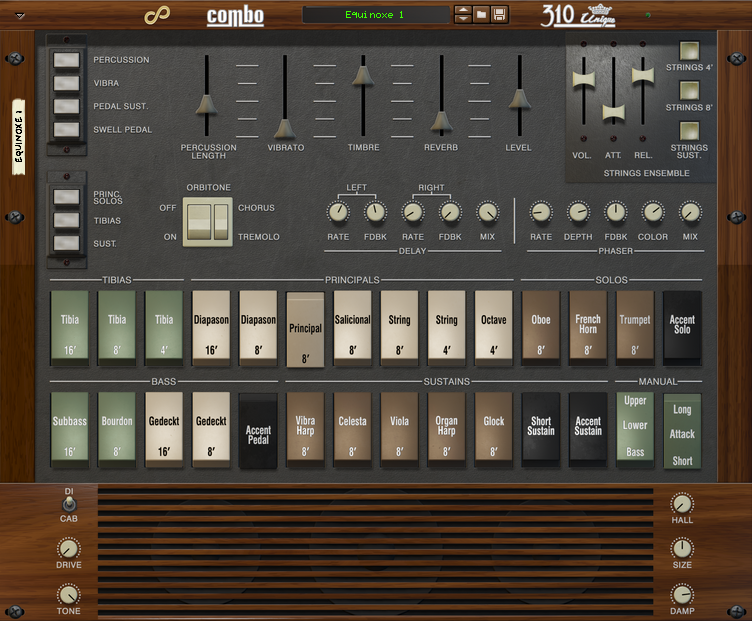 The Combo 310 Unique is now available for Reason for only $/€29! Featuring brand new, high quality stereo strings samples, and all the other voices from JP's own 310U, recorded both direct and miked, with the main 310U features, including the percussion select, largely intact. A basic delay and phaser effect are also included, plus a wealth of dual manual Combinators, plus plenty of Jarre-inspired presets. ... can it replicate the Oxygene 7 laser harp sound, though? The Oxygene 7 lead wasn't done the 310U, afaict, or at least, not on an unmodified one: it clearly has an amp attack envelope. If it is 310, and it does sound 310ish, then either the percussion circuits are modified, or it might be processed in PT and an envelope added post recording. My guess though is it's a 310U like percussion sound (i.e, on Octave 4) recreated on other synth. Whether that's correct or not, that said, on the Combo 310U I did add the ability to increase the amp env attack, so ironically using Combo 310U's Equinoxe 4 Lead patch, which is Octave 4, and plus a bit of attack time gets in you a right ballpark. So basically, if Oxygene 7 used a 310U for the lead, then yes, Combo 310U can replicate it! You know, you should do a vsti version out of this. You'd have significantly more customers. It's one bit of gear that a lot of would be em musicians out there lust after. Wow! I just found out about this today! And went straight to buy it. Nice work! And the interface is gorgeous. I stopped working on my Reaktor version last year, as I started a new job with much less time to spend in any other things. BUT, also today the great event we have waited for 10 years happened: Reaktor 6 was released! I may start working in my Reaktor version again. But I don't want to compete with a commercial version, as it will be unfair for the developer anyway, so I may keep it for myself for the time being. The intro in Oxygene 7 is one preset tab of the Eminent 310, Octave 4'. Listen here I believe Radek mentioned this somewhere. The sound example is just my Reaktor oscillator through an All Pass and a 1-Pole low pass filter to smooth the waveform (with a bit of reverb), which basically is the way the 310 did it, or any other string machine anyhow: just one pulse oscillator through a different set of filters to create the different registers. The Combo 310 Unique has the preset. Rise the reverb tab a little in sample mode and it is exactly the same. Good to hear there is a lot of interest in the old beloved Eminent still. I would have given anything to play with the real thing. But here in the States, I still have to find one. This is your first post? I thought you had posted here before. I mean look at the join date! I didn't even remember I HAD an account here! Good to hear from you! I miss KVR and making music. To answer directly a couple of points. Yes, that's true we can't phase sync these types of samples; but in practice when it comes to ensembles, I feel most people would be hard pressed to tell the difference, due the action of the ensemble itself. I've got that 310U sitting behind me right now, and I doubt I could tell the difference to a percentage significantly better than just guessing if the test were blind enough between that and the samples. Phase-locking is required in organs to prevent phase-cancelling. But phase cancelling doesn't really occur when running through an ensemble because of the way the delay lines operate, it's frequency-modulated over three offset channels. I won't say it has no impact at all, but I've never noticed phase-cancelling with any ensemble samples in the past. To an extent samples actually make the ensemble effect smoother. If you imagine that in the original machines all the notes are modulated at the end: the two LFOs are actually still fairly obvious, repeating roughly once every 2 seconds. In samples, certainly where the samples are per-note, that fixed modulation is now also per note, as it won't start in exactly the same place. So playing multiple notes now actually adds some useful overlap in the modulation, so action of the modulation itself is far less obvious. So in one sense, yes, it's not identical to a real ensemble, but in another sense it's just as valid an approach with useful advantages of its own. If it had been technically possible back in 1972, it would likely would have been two LFOs per note to further mask the modulation effect. But then these were cheap, portable home or gigging organs, not Novachords . For non-ensemble organ tones, however, it's different as without phase-locking there can be some issues with certain voicing combinations causing phase-cancelling which results in certain harmonics being "lost". But in practice even then it rarely troubles me using samples. Indeed, no-one ever complains about running multi-oscillator synthesizers without phase sync and exactly the same effect occurring! (Or maybe they do, I tend to avoid KVR and Gearslutz ). There's a world of difference between what may occasionally be noticeable when soloed, and minor issues that might remain audible in a mix; things like a bit of AC noise and the odd phase-cancelled harmonic simply gets masked. And I miss our long chats on making the best string ensemble in the world! If it had been technically possible back in 1972, it would likely would have been two LFOs per note to further mask the modulation effect. Yeah that certainly would be interesting to hear implemented. I was not able to play with it more, as I just clean installed Windows 10 in my music machine. I'm extremely jealous of the interface, not just because I like it, but because I was planning to do something similar for Reaktor, using the same kind of organ tabs, instead of the ones on the 310. I never liked the sound of the Freeman ensemble, sounds too synthy. And there is not much of a difference when comparing the Freeman and the Eminent actually, with the 2 different approaches to the chorus. The harmonics of each note is really where the crafting is at, and what "makes" an instrument. An example very close to home is the Eminent 310, that's what sets it apart from the ARP Solina String Ensemble. BlahBlahCafe Forum Index » Jean Michel Jarre » Instruments » Combo 310 Unique for Reason is now available.